The Molten Tigrex is quite a rare subspecies of normal Tigrex. As its name suggests, the skin of the magma Tigrex has a red color. In addition, the Molten Tigrex differs in size from the other Tigrex species, since this monster is pretty huge. 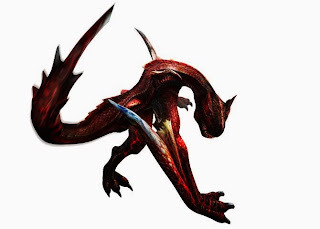 Most effective against this subspecies are ice-and-water-element arms, as these cause the most damage to the Molten Tigrex. This monster does not use elements in the fight, which is why you must pay attention to any particular element in the protection of your armor. However, the Molten Tigrex possesses the special ability explosive powder to distribute. Destructible body parts of the monster are his face, his two wings claws and its tail, which you can cut off with bladed weapons also. Basically, the Molten Tigrex uses the same attacks as the brachial Tigrex, only he sets many of his attacks at the same time explosive powder-free, that explodes after a short time. If you walk in the pure powder, you will thus cover and he explodes after some time. To the explosive powder to get rid of, you have to roll on the ground several times. In some attacks, the base explodes instantly where it strikes out with his claws. For example, when he runs to you on his claws and ram repeatedly into the ground because he is so huge. He is often quickly turns around and you'll hit it as good as ever. The Molten Tigrex can of course also get into a rampage mode, in which he starts to glow red and his speed is increased. In this state, it is often stomp you behind, which is very dangerous because this attack caused much damage and is not easy to avoid. In addition, the ground explodes wherever the Molten Tigrex stomps out. But this is not enough and the Molten Tigrex can even get into a second rampage mode. In this stronger rampage mode the Monster starts with a mighty roar, which looks similar to the brachial Tigrex. In fact, the Molten Tigrex this strong roar uses in this state now quite often as an attack and so directly to you. This roar harms you also if you stand too close to the monster.